Graphic Designer Pragati Asthana Srivastava takes us through her journey and her day, as a Technology Entrepreneur in Lucknow. 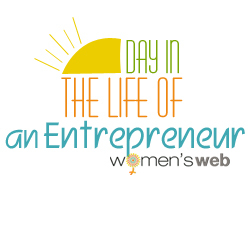 In this series, ‘Day In The Life Of An Entrepreneur’, we invite women entrepreneurs at work in India, to share their stories, and tell us what their life is all about. This post is from Pragati Srivastava who runs a graphic designing business and team in Lucknow, called Progressive Web. I started my IT career after completing my M.Sc (IT) in year 2000 and got married a few years later. My journey began as a Programmer, after which I became a Computer Science teacher and later a Center Head at the Institution of Electronics and Telecommunications Engineers (IETE), Kanpur. At that time, it was my dream to start my own business but after marriage I thought that it would be very difficult to fulfill my dreams. Just after the Y2K issue resolution and Internet boom, the IT industry paradigm was shifting from big smart client applications to web based applications worldwide. The era of data sharing took off with social sites, websites for advertising and business, portals and e-commerce. Soon, with the growing popularity of User Interface (UI) designing, my inherent design instincts drove me to learn the necessary tools; initially, I did this just as ‘time pass’ as my husband was working in south India and I was staying with my in-laws. In 2004, our little princess entered our lives, and I also joined a small designing team in Lucknow – without pay. It was a tough call but my husband convinced me to focus on sharpening my designing skills and place money as the last priority on the list at least for the next quarter. At the end of four months, I started getting a conveyance allowance and I left the team after another two months. This is when I actually began valuing myself since the company tried to retain me and offered me a salary along with a half day, work from home option. Instead, this was the time I actually executed the first baby steps to fulfill my dream of becoming an entrepreneur. I began searching for graphic designing projects on portals that allow freelancers to work with clients. At this stage, I was applying for around 150 projects on a daily basis and cracked my first deal after three months. I signed the deal but faced a lot of challenges with respect to resources, conflicts, requirement changes, iterations and delivered it with some delay. It was a good learning for me in terms of creating a structured approach, planning, estimation, timely communication and generating trust between the stakeholders. I made certain changes in myself and my working style to win more projects. In 2009, I decided to focus only on a specialized area i.e. graphic designing for specific projects such as websites, logos, headers and book covers, which was my strength and it worked unbelievably! In just six months, I was overloaded with work and hired a few designers on contract to join the team, thus creating the first team at my business, Progressive Web. Incidentally, I had only been working with US and Australians clients until then, but made my first inroads into the Indian market when Women’s Web was launched and I created some of the early design for the website and social media! I am very happy that my dream has come true and I can now see the light at the end of the tunnel to grow further. Today, the bonding and trust between our team and some of our clients is so strong that in many cases, we do not even need to discuss budgets and deadlines – we are so aware of their requirements. I still recall the time when I was chasing projects and now, customers approach me to get their work done. An exciting and surprising event in my journey occurred last year when a larger company approached me with a take-over plan. It excited me momentarily but after thinking over it, I realized that my dream was now on its wings and I am living it. I have started this not only for the money but also to help others, groom new talent and give something back to society. So, while I was excited, I declined the offer. Through all these ups and downs, I cherish the support of my family, and my in-laws who never let me feel the absence of my mother. My family was completed in 2011 with the addition of a son. My day starts as a mother, preparing tiffin and breakfast for my naughty little ones and sending them to school. Today, when there are no geographical boundaries, it does not matter whether you operate from home from a smaller town or have a full-fledged office setup at a posh location in some metropolitan city – so long as you deliver what you commit to. If you follow the basic thumb rule that ‘Time is money’, everything else falls in place. I operate my business from home and many of my team members work remotely, so we connect to each other through calls or chat to coordinate work and prioritize. We also meet up as required. I spend time with my kids in the evening; my actual work day goes from 8:00 PM to midnight at least thrice in a week. During this time, I have to talk, share issues, challenges, understand the requirements, conduct cost and time negotiations with clients and convince them that they will get every penny back through our services. I am very clear about a few things –transparency, crisp, clear and correct communication and we follow the same within the team as well as with client. As I believe firmly in the need for every person to have their own life, we avoid working on the weekends (except in exceptional cases) and this is also communicated to clients at the beginning itself to set the right expectations. While I know a business cannot be run on emotions alone, it is important to consider the intangible things (Goodwill, Brand, Value-add) while running it. If we run a business with human feelings, it does not require any monetary investment; rather, it needs only a few small things such as time, respect, value, honesty and transparency in which I believe and run it in this way, irrespective of the profit or loss.